Sponsored by: The Copeland Family Foundation. More information here. Location: First Parish Church, 535 Canton Ave. In recognition of the 350th Anniversary of the Town of Milton, the opening night of the 2012 Annual Milton Town Meeting will be held in the sanctuary of First Parish Church. First Parish was originally called The Meeting House because it was the largest available location where all citizens could gather for important civic activities in the early years, such as the annual Town Meetings. The Town Meeting process, based on the democratic principles of the ancient Greeks nearly 2500 years ago, is the basis of our democratic government today, wherein all citizens can be heard and all have an equal vote. Town Meeting government was the original system of government in the early Colonies, and it remains today in many New England Towns. For the opening night this year, all Town Meeting Members will gather, as the original Town Meeting Members gathered in the mid-1600's, at First Parish. In the same space as 350 years ago, citizens will discuss, decide and vote on the plans and financial affairs of the Town that pertain to the upcoming year. All Town Meeting Members are invited to come in period costume as well! The Mayor of Milton will be officially recognized while riding in the 350th Anniversary Parade in June 2012. The position carries no official power. Each dollar collected equals one vote. The candidate with the most votes (dollars) wins the “election". Checks should be made out to “Town of Milton” with “Milton 350th” in the memo. 100% of net proceeds, after expenses, raised by a candidate will be donated to the Milton 350th Committee. The 350th Anniversary Bulb Garden is blooming in front of the Milton Public Library's new granite sign. 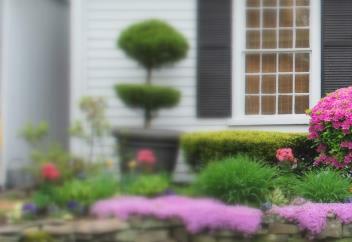 The garden of 350 colorful red, yellow and orange bulbs is the work of the Milton Garden Club. Barry Driscoll Landscaping helped to prepare the bed and the bulbs were donated and planted by members of the Garden Club. The bulbs should be in full bloom (if all goes well with the weather) for the annual Garden Club Perennial Sale and the Mass Memories Road Show sponsored by the 350th Committee at the Milton Library. Both events are scheduled for Saturday, May 12. 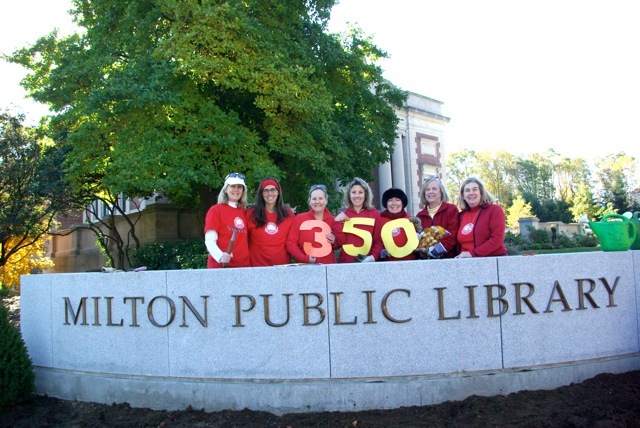 Stop by the Library to enjoy 350 beautiful spring bulbs planted in honor of Milton's 350th Anniversary. Opportunities for community members to share their stories and memorabilia. 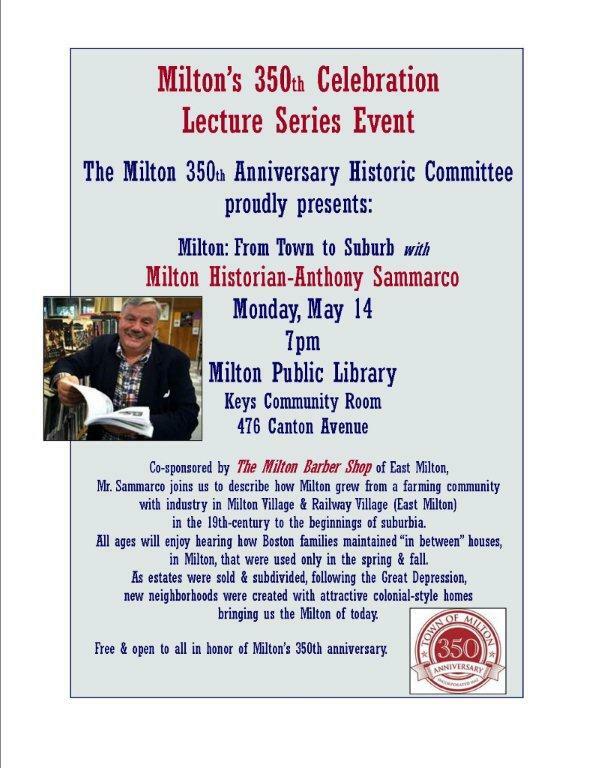 "Milton: From Town to Suburb"
Learn how Milton has transformed over the last 350 years! View poster here. Originally an agrarian community in the 1700's, Milton became a farming community with two industrial centers in Milton Village and Railway Village (now East Milton) in the 1800's. Then the beginnings of suburbia appeared in the early 1900's when wealthy Boston families maintained "in between" houses used only in the spring and the fall, which, after the Great Depression, were sold and subdivided. The land of these former estates became neighborhoods, built over the ensuing decades between WWII and the 1970's. These attractive Colonial-style houses make up the Milton we know today. Refreshments will be served at the reception after the lecture. Join Dr. Donald Gerry Kennedy, a descendent of the family that built the Kennedy home, now known as the Gordon House at Fuller Village, for a fascinating look at historic photos of the property along with lively stories of the Kennedy family. Dr. George Golding Kennedy, Don’s great grandfather, purchased the Shaw Estate in 1879 and built the "Gordon" house which Fuller Village preserved when the property was renovated. His father grew up on the property and told wonderful stories of growing up in Milton. Don, a retired history teacher and school superintendent, has spent a lifetime gathering a fascinating collection of Milton stories and photos from the members of the family who lived there. Join him to learn what life was like on Blue Hill Avenue over 100 years ago! For further information call Lisa Ramsay at 617-361-2116 or email here her here.